BREATH FLOW THRIVE : Where does the time go? I've joined a few more swaps on Swap-Bot and I've been busy working on my swaps and getting ready for Mother's day. This will be my first official Mom's day and I want to make and give out as many cards as I can. They are turning out great and I absolutely love how the first batch came out. I'm also putting together a journal for a swap. I made the journal myself and should do a post on it huh? Ok.
Well since I don't have any pictures (yet) of what I'm working on, I thought I'd share some of my REAL pictures. I am a Film girl...nothing digital - I like the crispness of the film shots and have been contemplating learning to develop color photos. May start my own dark room....oh ya!!! This is a picture I took out in a beautiful resort in Ojai, Ca. 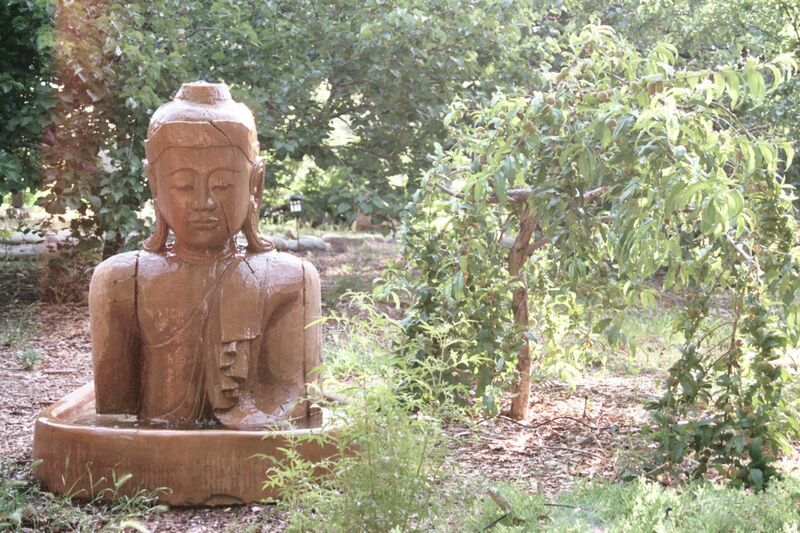 It was a meditation/yoga retreat and this fountain was outside the yoga studio. This is my step-daughter. We went to an church event and she loved this necklace. She wanted a picture asap. Isn't she a-dorable? (P.S. she's happy in this picture). About 3 years ago I took the bus everywhere! I was doing a year on public trans. to minimize my carbon footprint. I used to take my camera, which was awkward sometimes. I saw this one morning and loved the contrast of the cracked floor and the light hitting it. It touched my soul and had been a very important shot for me. I love pink. There. I said it. This leaves were a goldmine!! Love this shot! Your photos are lovely. I admire your carrying on with analog! I took a couple of analog photography classes recently, dark room and all. It is a lot harder to post good quality pics though! I still love my digital camera. Gorgeous photos! You have a great eye! !